1863 saw the crinoline still reigning triumphant with full bell-shaped skirts and tiny, nipped-in corseted waists the ideal silhouette—in part due to the support of the French Empress Eugénie. In more avant-garde circles, some were beginning to abandon the crinoline. 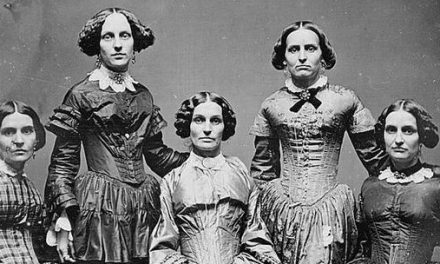 uropean fashion during the 1860s is distinguished by small waists, achieved with corsets, and fuller “bell” skirts. The shapes of these skirts are attained through the use of crinolines and hoops (Wikipedia). The column goes on to praise the crinoline, remarking that it “adds dignity to the figure, causes the waist to look smaller, and gives grace to many women, who would look awkward without it” (473). uropean day dresses displayed wide pagoda sleeves worn over under sleeves or engageantes (Wikipedia) (Fig. 5). Another notable sleeve style in the 1860s was the bishop sleeve, which is simply the gathering of the full pagoda sleeve into a decorated cuff (Fig. 2). Daywear featured high necklines and are usually emphasized with lace or tatted collars or chemisettes, achieving a demure look (Wikipedia) (Fig. 5). Daywear ensembles also come with matching mantles and cloaks, to be worn outdoors (Fig. 4). This article further notes that garments that emphasize the figure are ideal. In contrast to the daywear ensembles, evening gowns were much more revealing and had low off-the-shoulder necklines and short sleeves, and were accessorized with short gloves or lace or crocheted finger-less mitts (Wikipedia) (Fig. 7-12). 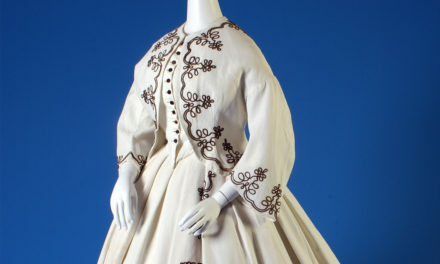 Dresses in the 1860s, both daywear and evening, were embellished with ruffles, pleats, and scallops. Hairstyles during the 1860s often featured a part in the middle. Hair was usually smoothed or waved over the ears. The ends of the hair was worn pinned in a bun or roll. To keep hair in place, braids are used and then pinned in varied fashions to the head. Occasionally, a few curls dangled behind the neck. Holding the hair in place was usually achieved using hair oils and pomades (Wikipedia) (Fig. 3, 9). Bonnets were prevalent as a hair accessory during the 1860s (Fig. 4). As for the fashionability of Franz Xaver Winterhalter’s portrait of Marie Henriette (Fig. 7). It is safe to say that her evening ensemble is within the acceptable parameters of fashion at that time. The most telling detail that classifies it as “fashionable” is the silhouette of the dress, with its slim waist and full skirt, achieved with a corset and a crinoline. 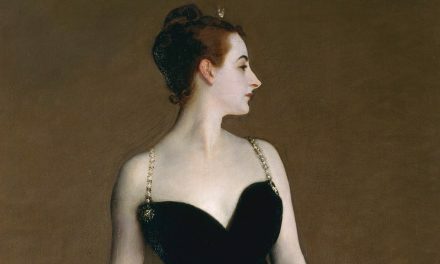 The exposure of the décolleté are is also considered fashionable during the 1860s. The color and material too, falls within fashionable propriety, emphasizing her youth with white and the lightness of the fabric used. Tétart-Vittu, Françoise, and Gloria Groom.”Key Dates in Fashion and Commerce, 1851–89″. Impressionism, Fashion and Modernity, ed. Gloria Groom. New Haven: Yale University Press, 2012. The department store Au Louvre is renamed Les Grands Magasins du Louvre (Tétart-Vittu 273). 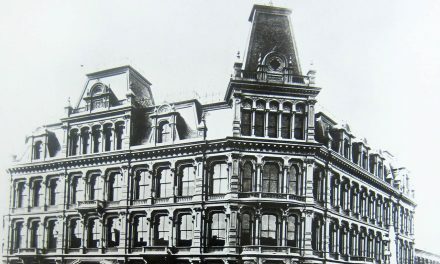 First listing of the couturier Émile Pingat (1820–1901) in the Bottin du commerce. A rival to Worth as a designer and as a tastemaker, the dressmaker Pingat, also specializes in outerwear, such as opera coats, jackets, and mantles (Tétart-Vittu 273). To discover primary/period sources, explore the categories below. Have a primary source to suggest? Or a newly digitized periodical/book to announce? Contact us! Also see the 19th-century overview page for more research sources... or browse our Zotero library. Sandra Muniz, a Fashion Design - Special Occasion BFA student at FIT (Class of 2017), wrote this researched and wrote this in Spring 2017 while taking HA 301: Fashion and Impressionism, taught by Prof. Justine De Young. She has a special love for bridal design, art history, and historical garments.